It is arguably the world's most dangerous hobby. Every year and at every circuit, thousands of enthusiastic fans volunteer to become race marshals, giving up their free time to help ensure the smooth running of a Formula 1 race weekend. Up before sunrise and not home until long after sunset, it is a long and tiring day where they have to be alert to act at any moment. It is testament to their ability that on-track action this season has rarely been delayed for any real length of time to deal with the after effects of a crash or collision. They scurry on to the circuit to sweep up debris before swiftly retreating behind the safety of a barrier, all in a matter of minutes. At least twice this season, though, we have been reminded about just how close to danger they are. In Russia in October, one marshal had a close shave when Sebastian Vettel's Ferrari flew past him just seconds after he had sprinted onto the track to retrieve some debris, while another marshal did something similar during the Mexican Grand Prix. It is not just fast cars that marshals have to be wary of, but also the weather. During second practice for the United States Grand Prix, as rain lashed down on the circuit, they were evacuated because of the risk of a lightning strike in the area. The nature of a marshal's role means a good race weekend will be one where they have been anonymous. 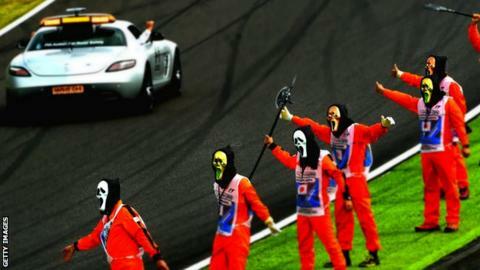 They have, though occasionally stolen the show, sometimes wearing masks at races close to Halloween between practice sessions or staging a mock pitstop with the safety car. Despite the ever-present threat of danger, the long hours and adverse weather conditions, the marshals do it all with a smile.